Import Duty Fraud in Argentina. Adventist Health System-Sunbelt Pays $115 M fine for Fraud. An academic study on the lack of financial transparency in the Adventist Church. The LifePoint stock investment article followup letters. MCA makes recommendations to GC Study Commission on ministries, services and structures. Recent newsletter note new GC Study Commission on ministries, services and structures. Churches are continued target of scams. MCA Conference on Church Organization. As audacious as it may sound, this book from MCA can make you a better church member, and save the corporate church millions of dollars in the process. Who Watches? Who Cares? 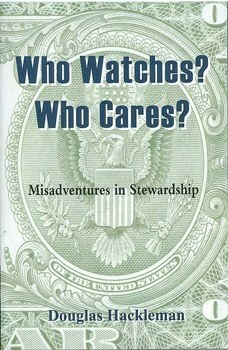 was published May 2008 in the hope of saving the SDA Church from additional massive financial losses. Nineteen graphs and tables, and an index of names, augment the narrative along with over 1,100 endnotes. Transparently positive concluding essays by Frank Knittel, W. Arden Clarke and Stewart Shankel suggest constructive solutions for the structural and procedural weaknesses that have made these and other similar misadventures possible. The power of these unusually readable and heavily sourced stories to prevent future such misadventures depends entirely on how many involved church-loving members, pastors and administrators will internalize the lessons they teach. The greatest need of the Seventh-day Adventist Church is for well informed members to give liberally not only of their tithes and offerings but of their very best judgment--as church board members, as constituency meeting delegates, as local and union conference committee members and as institutional trustees. Members for Church Accountability, Inc.
Members for Church Accountability (MCA) is a group of Seventh-day Adventist church members concerned about improving accountability within the SDA church. We are working together using responsible and constructive means to improve church accountability. Our church government is one that nominally places final responsibility for church conduct in the hands of the church members. We believe that in practice, the general church membership does not now exercise effective direction over the higher levels of church organization. We believe that it is necessary to return effective direction of church conduct to the general church membership. This is the way we say our church is intended to be run, and if we are saying that, we ought to do it. However, judging by events of the last decades, it seems that we also need this correction in order to avoid a potentially increasing sequence of incidents of improper conduct on the part of church leaders that are an embarrassment to the church. We would like to bring needed change to the church by working in a restrained and responsible manner. We do not want to be disruptive to the functioning of the church. We would like the functioning of our own organization to be frankly boring. It is our hope that a large number of church members will take the responsibility of joining us in the uninteresting yet necessary task of insuring proper accountability within the SDA church. The primary focus of our organization is the improvement of financial accountability. We believe that this can be accomplished by some relatively simple policy changes including the allowing of responsible access to church financial records by groups of church members, a "Freedom of Information" policy, if you will. The secondary focus of our organization is returning responsibility for directing church policy and conduct to the church membership. We believe that this also can be accomplished by relatively simple changes in the constitutions and bylaws of church government. We would like to invite SDA church members to join our organization and work with us toward improving accountability in our church. There are no member fees. We publish a quarterly newsletter. Yes, we do welcome tax deductible (USA) contributions to help with our expenses.